A historic building like the Weinberg Center is full of interesting spaces and stories. On my second day interning here, tours were being given for local school children. The guide was explaining to them how the building was originally a movie theater and that the original projection booth was like a “snap shot” in time to that earlier place. He didn’t take the large group of students up that day, but he recommended I make sure to visit it during my time here. My curiosity immediately spiked, and I knew before I left here I had to go up and see it. The other day I finally had the opportunity to see it for myself. As I walked in, I was immediately surrounded by darkness, as well as years of history. From seeing old films, to lights, to projectors, I knew this room had a history and I wanted to find out more. I also began to wonder if the projection booth had been used for anything else, as it’s such a small space tucked in the back of the theatre. Greg said, “It’s always been used as a projection booth; however we no longer use it as that. We now project from the projector mounted to the front of the balcony. We use the booth for one of our 2 spotlight positions. However, at one point it was used as an office.” He also informed me that when one is up there during a performance, you can’t really hear anything that’s going on down on the stage because of how loud it is in there with all the fans going. 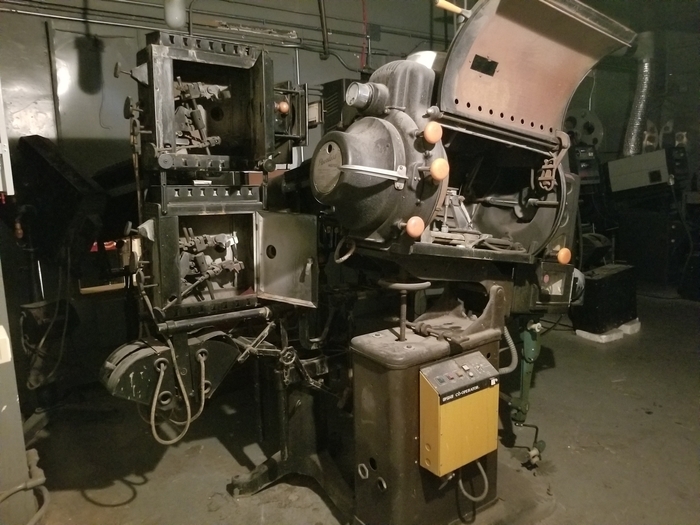 While I would like to tell more about the projection booth, its history, and hidden treasures, I can’t give all the secrets away! If you would like to see the magic for yourself, come down to the Weinberg Center for one of our free tours offered throughout the year. The next tour is Tuesday, July 24 at 2:00 PM. For the complete tour schedule click here.